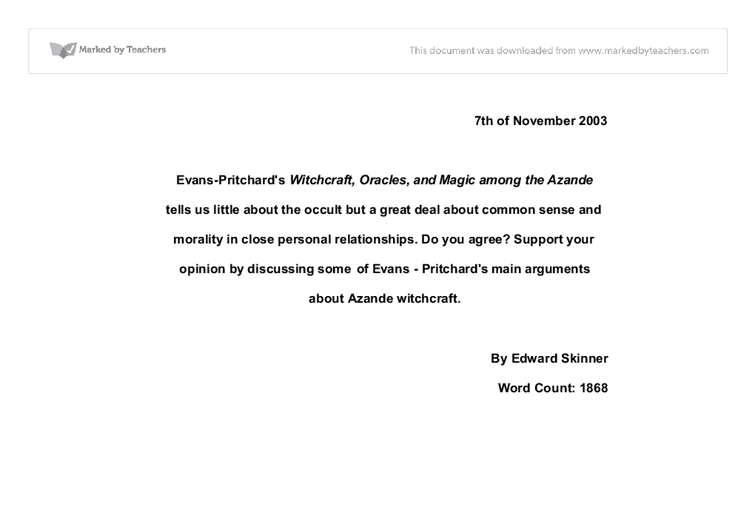 7th of November 2003 Evans-Pritchard's Witchcraft, Oracles, and Magic among the Azande tells us little about the occult but a great deal about common sense and morality in close personal relationships. Do you agree? 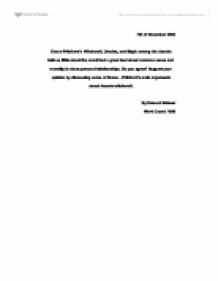 Support your opinion by discussing some of Evans - Pritchard's main arguments about Azande witchcraft. By Edward Skinner Word Count: 1868 To answer an essay like this, it is first important to understand the term 'witchcraft' in the same way as the Azande people of Southern Sudan. Witchcraft to the Azande is a physical substance that is found in the stomachs of witches (page 2). Evans - Pritchard explains that he believes this 'substance' is simply the small intestine during certain stages of digestion. Witches do not show any external signs that they are indeed witches. More than simply being a physical trait, witchcraft is inherited (page 2). It is handed down in families from father to son, and from mother to daughter. The witchcraft a witch possess grows as the individual grows (page 7), that is to say the son of a male witch, whilst containing this witchcraft substance, will not contain enough to be of threat to an adult. It is only when they get older, and when the witchcraft substance they contain begins to grow that they can become a possible threat to other adults. It is important to note that to the Azande a witch is an unremarkable agent. ...read more. The victim may lament their loss but will tend not to take steps to identify the witch. It is only when identifying the witch responsible is of tangible benefit that the name of the witch is sought, for example if a man is ill and has been ill for a length of time, finding the witch responsible may be the only way to cure him (page 33). Even when a practising witch is identified, the kinds of hysteria associated with the Salem Witch Hunts are notable only by their absence. So long as the injured party are the witch observe correct behaviour then the incident will pass without so much as a harsh word being uttered, or the relationship between the two being spoiled. It is dealt with diplomatically, politely, and respectfully. Every one has a right to ask the witch to leave them alone, but equally the witch is also a tribesman and as such has a right to live his life free from fear of reprisals. If a victim were to attack a witch either verbally or physically he could reasonably expect to lose prestige, and find himself liable for damages if taken to court (page 34). He would also be aware that he had increased the hatred of one witch against him, something that no Zande wants for obvious reasons. Equally if a witch refuses to accept responsibility he will lose social prestige and may reasonably expect vengeance attacks if his victim dies (page 35). ...read more. The people accused by the oracle will more often than not be surprised they have been accused, but because they have complete faith in the oracle they will accept the accusation. They will believe that they are the only person who has been harming someone without their explicit knowledge, that they are an anomaly. Witchcraft does not make someone tell lies (page 26). Anyone who claims any different is laughed at. Therefore the Azande believe people to be fully aware and responsible of their actions at all times. I would agree strongly that Evans - Pritchard's book is more about common sense and morals than about the occult. Witchcraft seems little more than a thought process the Azande use to explain their world. It gives them a reason to act in a moral way because otherwise they may become the enemy of a witch and suffer the consequences. All practises associated with witchcraft are polite; witches are not shunned, hurt or beaten and are instead treated with respect. The rules of witchcraft prevent false accusations being made. Equally there is a great deal of commonsense integrated into the concept of witchcraft. Take the belief that witchcraft can be passed from father to son and mother to daughter; this seems likely to have originated from the observation that son's often have physical traits of the fathers and daughters of their mothers. It was therefore commonsense, to the Azande at least, to assume witchcraft was passed down also. As it seems commonsense that a adult has more witchcraft substance than a child. These are commonsense observations that have become part of the fundamental concept of witchcraft. ...read more. The climactic scene in Biff's life comes when he finds a woman in Willy's hotel room. This causes Biff to realize that Willy is a fake. Biff's tragedy is that he has accepted Willy's values all his life, and now that he finds out they are false, he has no values of his own to rely upon. Do any features of Willy resemble your own father? 5. What did the unnamed woman mean when she said that Death of a Salesman is a "time-bomb under American capitalism?" Do you agree with her? What do you think about Arthur Miller's response to this woman? In The Order Of Things, Foucault challenges new intellectual writings in regard to the change in utopian thought. In the classical period, utopia was the dream of an ideal beginning in which everything would perfectly fit into Tables of Representation. Catherine is trying to let Eddie go and vice versa, but they both know they will always love each other. Catherine is afraid of Eddie and what he's going to do next. She shows this because she wants to leave New York to go to Italy with Rodolfo once they are married. The first mentioned was Tituba who was known for her legends in Barbados and was associated with voodoo (Roberts 27). The second was Sarah Good; she smoked a pipe and begged from house to house. If anyone refused her, the craggy old hag went away muttering threats to her neighbors. July 19th Rebecca Nurse, Susannah Martin, Elizabeth Howe, Sarah Good, and Sarah Wildes were also executed. Here it is, 1692, a society where if enough people said another person was a witch then that person was arrested and or executed.